Do you suffer from mood swings and irritability? Nature Made's SAM-e Complete™ may very well be your natural, safe answer. It's designed to work with neurotransmitters dopamine and serotonin to boost your general mood in as little as seven to fourteen days. LoveToKnow spoke with Lynn Laboranti, MS, RD, Nature Made® Consumer Education Specialist to find out how it works and how to determine if you should take it. LTK: What is it SAM-e Complete™, exactly? 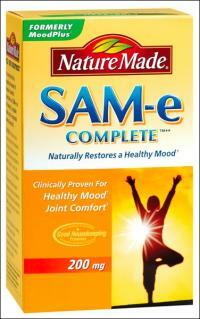 NM: Nature Made® SAM-e Complete™ is a natural and safe way to maintain a healthy mood. SAM-e (S-adenosyl-methionine) is a naturally occurring molecule in the body that helps maintain a healthy mood. SAM-e is found in every cell in the body, but your natural levels can become depleted due to a poor diet and with age. Studies have shown that low levels of SAM-e can contribute to moodiness and irritability. Nature Made® SAM-e Complete™ replenishes the body's SAM-e levels and helps restore a good mood. NM: SAM-e helps fuel dozens of important reactions in the body. These reactions include the production and metabolism of hormones, neurotransmitters (brain messengers), nucleic acids (found in DNA), proteins and phospholipids (a component of cell membranes). Studies have shown that SAM-e enhances your mood by promoting a healthy balance of the neurotransmitters dopamine and serotonin, which are part of overall healthy brain cell functions. LTK: How long has SAM-e Complete™ been available? NM: SAM-e Complete™ launched in May of this year. It was previously sold as MoodPlus SAM-e, and SAM-e has been available in the U.S. since 1999. LTK: Do you get much feedback on SAM-e Complete™ from consumers? Can you share your favorite success story? NM: SAM-e Complete™ receives a lot of positive consumer feedback and has a loyal following because of the difference people can feel in their mood. According to one consumer, Thom F., who has been taking SAM-e for years, "I fought mood swings and irritability. My kids called this "Dad Moods". I am able to control my emotions now. It has given me more energy and more focus. It is that little extra boost I need." LTK: How does this product differ from St.John's Wort and other mood enhancers? What about MSM and other bone and joint supplements? NM: SAM-e is produced by the body and has extensive scientific research behind it. It also has fewer contraindications and side effects than other mood enhancers. SAM-e should not be taken in combination with St. John's Wort. SAM-e is primarily used to support mood and well-being. Some studies have shown it to be beneficial for joint support. LTK: How did SAM-e Complete™ get its name? NM: It is called SAM-e Complete™ because we wanted to make clear to consumers that this is a SAM-e supplement, and because SAM-e can benefit body functions, including mood support and joint comfort. LTK: Where is this product sold? What is the price range? NM: Nature Made® SAM-e Complete™ is sold at national drug, grocery, discount and club stores, such as Costco, CVS, Target, Walgreens and Wal-Mart. Nature Made® SAM-e Complete™ is a good choice because its SAM-e comes in special, moisture sensitive packaging to ensure potency. SAM-e Complete™ averages about $39.99 for a 36-day supply based on a 400 mg/day dose. LTK: Who is your target consumer for this particular product? Who should not take it? NM: SAM-e has been shown to help restore a healthy mood safely and naturally. Anyone who feels like they could use a mood boost may want to try Nature Made® SAM-e Complete™. People who are bi-polar, pregnant or nursing should consult their health care professional prior to taking SAM-e Complete™. LTK: Are there any side effects that you know of that come from taking this product? NM: There are no known significant side effects. Some people may experience mild stomach upset that may occur with high doses of SAM-e.
LTK: Are there any medications/vitamins/supplements that work well with SAM-e to achieve maximum results? Similarly, are there any medications/vitamins/supplements (OTC or prescription) that people should stay away from when taking this product? NM: SAM-e is effective when taken by itself. If someone is currently taking a prescription antidepressant, they should first consult with their doctor before taking SAM-e. Consumers should consult with their health care professional for details on which prescription medications they are taking that SAM-e can be combined with and which may have possible interactions. LTK: What is the recommended dosage? NM: Nature Made® recommends someone start taking 400 mg of SAM-e Complete™ per day. If desired results are not experienced, people can increase their dosage to a maximum of 1600mg/day. SAM-e Complete™ has been clinically proven to help naturally achieve a healthy mood in as little as 7 to 14 days, when taken daily. LTK: How do you know if you'll benefit from SAM-e, or at least that you're a good candidate? NM: You can find our Mood Quiz on SAM-e.com. By answering a short series of questions, you can see if SAM-e is right for you. In general, if you have felt more moody and irritable than usual, you might benefit from taking a daily SAM-e supplement. LTK: Tell me a bit about Nature Made®. What are the ideas behind the company? How was it started, why, and what are the philosophies that make it stand out among the competition? NM: For more than 35 years, Pharmavite, manufacturer of Nature Made® vitamins, has earned and maintained the trust of pharmacists, consumers, and retailers by manufacturing high-quality vitamins, minerals, herbs and other dietary supplements that are safe, effective and science-based. As a leader in the dietary supplement industry, Pharmavite swiftly adopted the FDA-released Good Manufacturing Practices (GMPs) introduced in June 2007, which sets rigorous manufacturing standards for the supplement industry. Nature Made® was also the first line of dietary supplements to earn certification in the United States Pharmacopoeia's Verification Program. Nature Made® Liquid Softgels® Responding to consumers' desire for an easy-to-swallow line of supplements, Nature Made® recently launched a new line of liquid softgels. Specially formulated for easy absorption, the Nature Made® Liquid Softgels product line includes: Multi Complete, Multi For Her, Multi For Her 50+, Multi For Him, Calcium 600 mg with Vitamin D, Vitamin C 500 mg, Vitamin D 1,000 IU and Super B-Complex. Nature Made® Cholestoff® Nature Made® CholestOff addresses consumers' need for a safe, effective and natural solution to cholesterol management with the help of plant sterols and stanols, which are clinically proven to inhibit cholesterol absorption and reduce LDL ("bad") cholesterol and total cholesterol levels in as little as 30 days. Studied since the 1950s, plant sterols and stanols have demonstrated their effectiveness in safely lowering cholesterol levels. National Cholesterol Education Program also developed therapeutic lifestyle changes for individuals to help reduce their cholesterol levels and recommends consuming two grams of plant sterols and stanols daily, as part of an overall healthy diet, weight management and regular exercise program. Nature Made® offers CholestOff, CholestOff Complete and Multi+CholestOff as part of their popular product line. Nature Made® TripleFlex® Nature Made® TripleFlex is a line of non-prescription, joint healthy products that may help nourish, cushion and strengthen joints. TripleFlex Triple Strength combines glucosamine, chondroitin and MSM (methylsulfonylmethane) in one convenient formula. LTK: On the Nature Made® website, it states that SAM-e is worth 300 Wellness Rewards. How does that work? NM: Members of the Nature Made® Wellness Advisor found on NatureMade.com have the benefit of earning free vitamins, supplements, herbs, fitness DVDs, nutrition bars, vitamin guides and more. Wellness Rewards can be banked by entering the codes found on Nature Made® product packages. Accumulated points can be redeemed for coupons for free products. Here's a link to the program page. If you catch yourself in a bad mood often, consider picking up a package of SAM-e Complete™. It's convenient, it's natural, and it's safe. Of course, if you're pregnant, nursing, or bi-polar, check with your doctor before taking this product. Within seven to fourteen days, you could find yourself feeling healthier and happier.